The self-propelled U-Safe lifesaving buoy from Noras Performance can be delivered to the victim via remote control. The U-Safe is shaped like a horseshoe, with a pair of electric turbines in the back that propel it quickly through the water. It is controlled from the shore with a thumbstick control, and the U-Safe is able to generate enough power to not only travel to the person, but also give them a ride back to shore. Great concept! Bravo!! Couple considerations: 1. Roughly 60% of drowning victims can not swim and struggle on the surface for about a minute before submerging- device needs to be quick. 2. Drowning persons can not effectively see, hear or think. Rescue devices need to touch the victim to initiate grasping response. 3 Device should therefore be soft/pliable and have some life line/grasping attachment. For more info please see my website: www.aquaticsafety. our company with headquarters in Germany deals with import and export of in Europe. We are interested in your product trade in Europe. Please specify the conditions and the wholesale price. Hi.i saw the video about life saver.it looks very good.Im interested in this product.How much far can go.and what is the speed.How much is the price for piece.Does it have insurance? I'm interested your product. It looks good and applicable. Would you please let me know about its price and more specification. Interested in the price.Do you need a Distributor in Singapore? Hello, I would like to buy your product or may be sell it for you? Please help me. Thank you. Where can I buy the product and at what price? Où peut-on acheter le produit et à quel prix? I am interested in distributing this product in Australia if you have no current arrangements in place. Hello I would like to sell your product.Please guide me. Its great idea ,Recently we also received inquirely from shipbuilder, so we are serching remotecontrolled buoy, if possible pls send catalog ,price,delivery etc. I am very much interested to have at least 2 units in every area in the Western Region of Saudi Arabia for the Search and Rescue Department of the Saudi Seaports Authority. 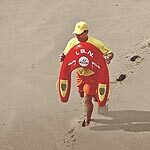 could a "transponder" be made to be clipped onto the swimwear of a person, so that the U safe would "home in" and find the struggling swimmer quickly without an unfamiliar "pilot" for the U Safe. Remote Controlled buoy, if possible pls send catalog ,price,delivery etc. I am just interested in purchasing the buoy. Can you give a contact to purchase? I'm interested in the product, can you advise on the availability and pricing. Could I have a price? Hi, I'm interested your product. It looks good and applicable.